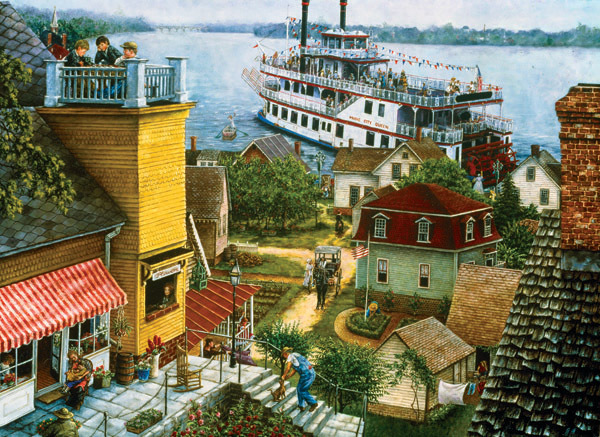 Paddle Boat Landing is a 500 piece jigsaw puzzle from SunsOut featuring artwork by Susan Brabeau. Larger pieces for easier seeing and handling making this the perfect puzzle for aging hands and eyes. Puzzle measures 26.625" x 19.25" when complete. I bought the puzzle for my aging father to keep his mind active and was glad I found your web site and how easy it was to order and the fast delivery. Very nice puzzle - lots of variety in terms of the subject elements. Have worked this several times. The perspective makes you feel you are right there or at least makes you wish you were. Great fun. Good locking and good size pieces. Wonderful, fun puzzle. Enjoyed working it with my grandchildren. It is tradition in our family, when we are together. No cell phones, only laughter. Once again, lots of activity, lots of interesting people, I love River boats, different houses and roofs. Great! It was a fun and challenging puzzle to work! My husband has been home bound due to recent back surgery. He is enjoying the puzzles we have been ordering from Puzzle Warehouse. Not only are the puzzles nice, they are also pretty and the ordering, shipping and also the handling process is excellent. Thank you. I liked so much I glued and framed it. Very enjoyable puzzle by one of my favorite artists. Colors and patterns are distinct which made for easier sorting and assembly. Also a good theme for summer. Nice! Love these large thicker pieces for easier handling. The pieces to this puzzle are large and fit together very well. The puzzle was very easy but still fun because there is so much going on in the picture. I usually do animals so this was different for me. This puzzle has a lot of detail and after it was completed I kept finding things I didn't notice when I was doing it. This was a fun puzzle to do. The pieces were bigger and thicker. The colors are beautiful. It just went together so easily. I normally like 1000 piece puzzles because they are more of a challenge. But this puzzle gave me a refreshing break from the larger, more challenging puzzles that I do. It was fast and easy to do. I highly recommend it! Judy O. 5 Stars Diana Donahue - Midlothian Va. The puzzle is easy to handle, and piece size is good. Pictures are beautiful. I loved this particular puzzle. It's still in progress at the moment. It's a moderate challenge, which is exactly what I was looking for. The manufacturing quality is superb, the size is perfect and I'm very happy. 5 Stars Deborah P - Wheat Ridge, Co. This is a fun puzzle, not too difficult but still a challenge. Love these larger pieces, but wish they 'interlocked' better. Still......it's a great puzzle and definitely worth the price. One that we will enjoy working many times again. Thank you. Not too easy and not too hard. Enjoyed putting together this puzzle.